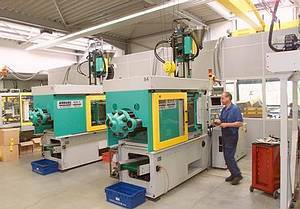 To meet individual customer requirements we have a total of 63 injection molding machines available. The clamping force covers a spectrum from 15 t to 320 t. The shot weight ranges from 0,1 g to 400 g.
Raw materials used are thermoplasts (ABS, PE, PP, POM, PC, PA, PMMA, PBT, PC/ABS, PC/PA), elastomers (silicone rubber) and thermoplastic elastomers (TPE, SEBS). A special technique we apply is multi-component injection molding, which is used for complex parts primarily. During manufacturing we attach great importance to permanent process monitoring by means of operation data acquisition, which in connection with a central material feed ensures a smooth manufacturing process, thereby providing the prerequisites to deliver parts of superior quality.